Always New Art - Spread the Word! The Hidden Garden Art Gallery offers quality original art in many mediums as well as museum-quality Giclee prints. HG is the largest of its kind in Guanacaste, more than 60 artists on exhibit, and 15 rooms full of paintings, sculptures and diverse artistic expressions. The gallery has 3,500 square feet of wall space, and more than 400 pieces on display. Rooms are coordinated by styles, ranging from geometric abstraction, to typical art, to underwater images. The Gallery is also home to the permanent exhibits of our resident artist Carlos Hiller underwater scenes, Susan Adams, Rebeca Alvarado Soto and many more. Our location, designed with a marvelous architecture, is the perfect setting for our cultural center. 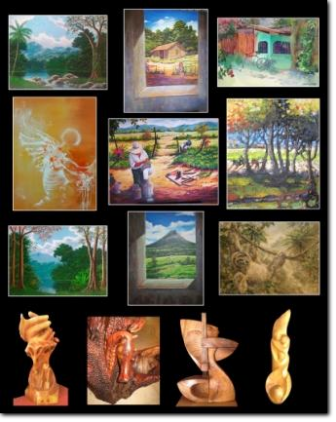 Our mission is to strengthen and heighten local artists’ works and share the beauty and culture of Costa Rica.